It's time for me to get back into the habit of exercising and more specifically, running. I've really slacked off these past several months in the exercise department, plus I've never been one to forego holiday cookies at parties in order to maintain my girlish figure (how very un-merry that would make me). 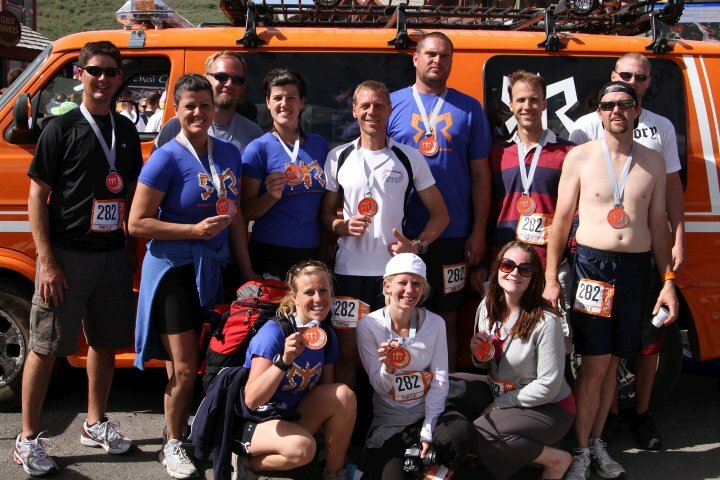 Last June I participated in a fantastic Ragnar Relay with 11 other amazing peeps, and I had such a blast that I'm doin' it again. These races consist of 12 sweaty people stuck in 2 vans for 30 hours, running around the clock through beautiful countryfor 190 miles or so, and having a great time. Sound fun? Of course it does! I also ran a half marathon last August, and I'm planning on a repeat performance of that race as well. The problem is, I'm not running anywhere with this extra holiday cookie love I've got goin' on right now. My sister injured her foot during the half marathon and I, being the wonderfully supportive sister I am, stopped running in the fall when she had to rest because of her foot. Sympathy sedentarism, you know. So it's back to the hampster wheel treadmill I go, until we're finished with -14°F weather and my nose stops running and then freezing the moment I go outside. I'm not a fan of treadmills -- they are.so.boring. but when you live in a frozen tundra they're a necessary evil. Are any of you runners? I would love training tips to help give me a jump start since I feel like I lost all my endurance somewhere between the Halloween candy and the Christmas cookies. I want to improve my personal times for both races, but I would definitely consider myself a casual runner. I just think it's fun, y'all. I'm now obsessed with running one of those relays. HOW FUN! I am dying over your last picture..hilarious. My sis and I do jazz hands all the time. I am a "runner" or as I like to call it, jogger, b/c there is nuthin' fast about this girl. As for the treadmill and boredom? I got nothing for you...I loathe the treadmill and I run outside...even when it's frigid. How fun you're doing Ragnar!!! I got on to sign up this year but it was already full so if ya wanna put a team together for next year please consider me. :) You can do intervals on your treadmill after you've done a 10min brisk walk warm up (around 4.8-5.4mph). be straddling your treadmill and then bump the speed up to 7 (6 if you're a bit nervous) once the speed is there get use to the new speed by allowing one foot to "wipe" (like you were wiping mud off your foot) the treadmill repeatedly until you feel like you're comfortable to jump on and then you sprint for 10 secs then jump off to straddle position again adn rest for 10 secs. (repeat at 10 secs 3 times) bump the time to 15 secs and if you feel good also bump the speed do this one again 15 on and 15 off 3 times. then go to 30secs 3 times then continue on to 45sec (do this one only twice) and then go to a full min (do this one only twice too) then work your way back down to 15 secs again. This is a good exercise to work on sprinting form and target your fast twitch muscle fibers (the ones you use for sprinting) and when you need a quick burst of speed during a long run or at the end of a long run when you need to push it to the finish.